Tony Castellano - "Fun Size"
Tony Castellano played bass for Holding Pattern in its later days and for the recent GNO project from Ludent Tremmel. 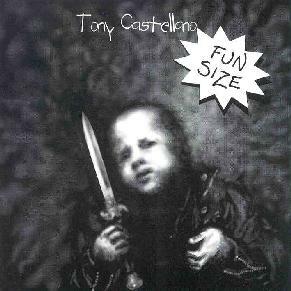 On Fun Size, Castellano offers up a true DIY effort in which he plays ALL the instruments including guitar, bass, keyboards, and drums. He's a mighty tight one-man band serving up heaping portions of 70's styled progressive rock that recalls Genesis, Yes, and Styx. "Billy's Xmas Spirit" is, as the title suggests, a Christmas song, but this opening track sets the progressive rock tone for the remainder of the album. I hear a resemblance to Styx circa Grand Illusion but don't let that scare you as there's nothing particularly pop rocky about this. It's accessible classic progressive with symphonic keyboards and tasteful guitar licks. I'm also reminded of parts of Steve Hackett's Please Don't Touch album. "Rifts & Festoons" is more along the lines of Trick/Wind era Genesis. "Billy's Reception" features acoustic guitars combined with symphonic keyboards, coming across like a mixture of Genesis and Jethro Tull. And "Knives" has a heavy rockin' Yes feel and is my favorite track on the disc. Castellano doesn't have Steve Howe's technical proficiency but he's sure got the FEEL down pat. Definitely my favorite track. A strong, if short, set of tunes that fans of classic progressive rock will enjoy. I hope to hear more from Castellano.